"A treasury of broken meditations and chipped singing, moments of insight and yearning appearing like bits of statuary plowed up in a field, perhaps more beautiful for their sudden unlikely emergence. Olena Kalytiak Davis's poems find evidence of the spirit everywhere, in laundromats, in parking lots and frozen landscapes, in the panic of birds." Olena Kalytiak Davis lives in Juneau, Alaska. A first-generation Ukrainian-American, she grew up in Detroit and has since lived in San Francisco, Prague, Lviv, Paris, Chicago, and the isolated Yup'ik community of Bethel, Alaska. She studied at Wayne State University, University of Michigan Law School, and Vermont College. 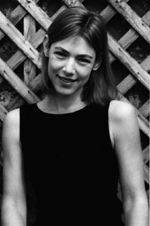 She was the winner of the 1996 Rona Jaffe Writer's award, and her poems have appeared in Best American Poetry 1995, New England Review, Poetry Northwest, Michigan Quarterly Review, Field, Indiana Review, and elsewhere. This is her first book.